Do you miss the days of being able to endlessly indulge in sweet treats after knocking on doors around the neighborhood for Halloween? 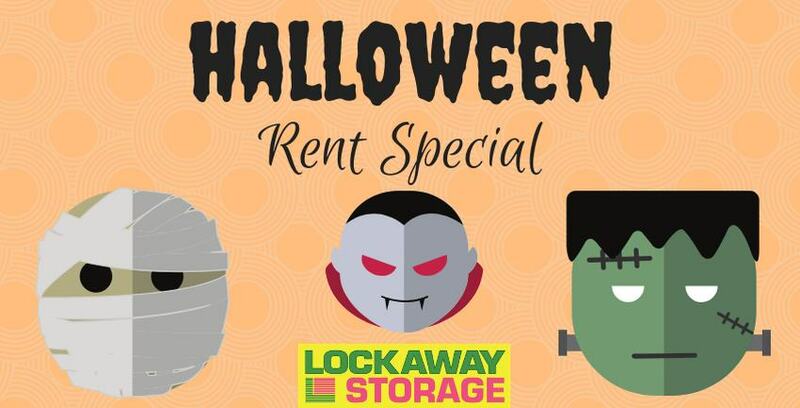 Well, Lockaway Storage - Randolph may not be the best place for candy on Halloween, but it will be offering a sweet rent special for its customers! Come in during office hours to pay rent anytime in the month of October while wearing a costume to receive a deal on your October or November rent. Mike Garrison, Manager at Lockaway Storage - Randolph, explained how the deal works. “Current renters have to come in to make a payment wearing the costume and they have to have their picture taken in the costume. Customers with self storage units 10’ x 15’ or smaller will receive $35 off their rent. Anything larger than 10’ x 15’ will receive $50 off,” Mike said. While the idea of having this fun Halloween special was created by former facility manager, Sedric Hadnot, once Mike heard about it he knew he had to keep the tradition. Don’t be shy. Grab the nearest Halloween mask you own or go all out and become “Lockaway Storage famous”! We love getting to know our customers and having deals like this surrounding a holiday that’s all about fun makes it easier. We can’t wait to see everyone in their costume and make everyone's day with discounted rent!